Over $10,000 was raised at the 24th Annual Trades Golf Tournament on June 13, 2013, to support Project Touchdown, an initiative in partnership with Terra Centre for Pregnant Teens. Project Touchdown, a transitional housing project located in Edmonton, will be specifically designed to meet the needs of young teen parents working hard to build a brighter future for themselves and their children. Once the first group of teens have completed their education and are solidly employed, they will move to traditional housing and Terra Centre will populate the Project Touchdown four-plex with another group of teens also committed to raising their children while going to school. Carr ington Construction and Bedrock Homes Trades participated in “Driven for Change”, a unique fundraising component of the Golf Tournament. 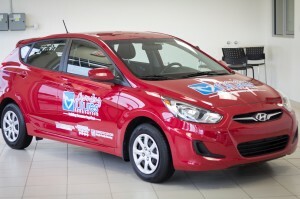 Carrington Group of Companies and Leduc Hyundai provided the grand prize, a 2013 Hyundai Accent. The second prize, provided by Carrington Group of Companies, was A Weekend for Two at Tower Ranch Golf & Country Club in Kelowna, B.C., complete with flight, hotel, 2 rounds of golf, and a meal voucher at Carrington’s Restaurant. The winner of both prizes was Paul Gutteridge, owner of Sandhills Manufacturing, who has been proudly serving the Edmonton and surrounding areas with quality stairs for over 20 years. Mr. Gutteridge plans to ‘pay it forward’ by raffling the car off among his 50 employees and donating the proceeds to Changing Futures Foundation. A big thank you goes out to all the Carrington Group of Companies employees and trades who made this event so successful!